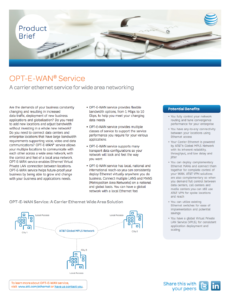 Switched, On Demand, Dedicated, Global (OPT-E-WAN), Ring Platforms. 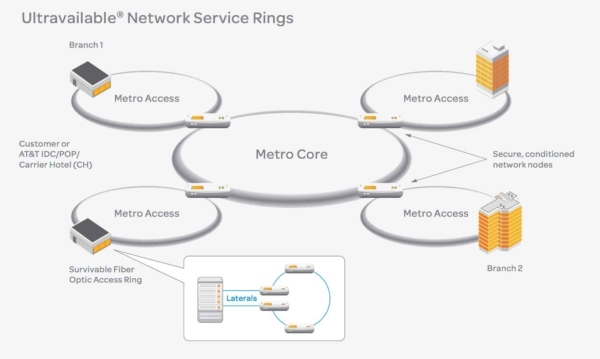 On-Demand: Dynamically provision, edit and scale Enterprise network applications, VPN, Ethernet, Internet and more. Cost-effective, fast and versatile; Ethernet carries your mission-critical data (streaming data, email and video content) wherever and whenever it is needed. Ethernet supports transport speeds from 2 Mbps to 10 Gbps with Point to Point, Point to Multipoint, or Multipoint configurations. Connect all locations together in a single virtual LAN, or enable virtual private lines from remote locations to your head office data center. 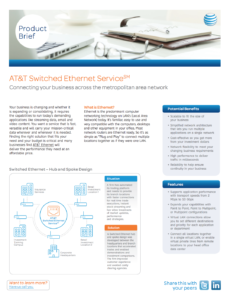 AT&T Switched Ethernet Service that allows you to deploy and modify new applications or services on your own. 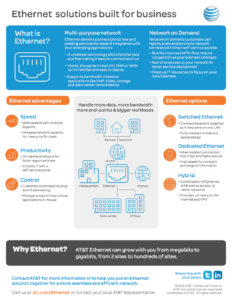 How is Dedicated Ethernet used? This access solution is provides a private, high speed, fiber optic connection to move your data to a back up facility or data centers. 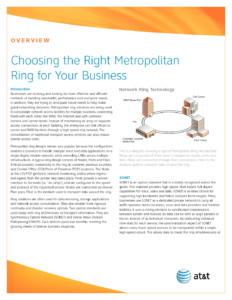 You can use dedicated ethernet as a disaster recovery and diversity option, circuit aggregation or as a network backbone. Is a layer 2 VPLS, utilizing MPLS infrastructure to connect multiple LANS and MANS and has local, national and international reach. AT&T Ultravailable® Network Service (UVN) is an integrated ring solution used for security solutions and cloud computing infrastructure, call center management, IP Data, Storage, consolidation, transport circuit aggregation, and the need for scalable high bandwidth. SONET and DWDM can be designed with diverse entry points to ensure no single-point-of-failure, deployed within a dedicated optical network exclusive to a single customer; no other business can use the same fiber.